Sens. 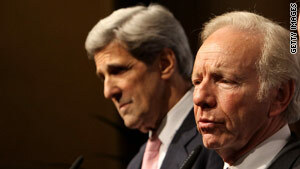 John Kerry, left, and Joe Lieberman had been set to announce a bipartisan bill April 26. Washington (CNN) -- Sens. John Kerry and Joe Lieberman announced Friday that they will unveil long-planned climate change legislation Wednesday, but they'll move forward without support from a key Republican they've worked with for months. Sen. Lindsey Graham, R-South Carolina, indicated that he's not on board with Kerry and Lieberman's bill. Graham said he believes that the legislation, which includes an expansion of offshore drilling, won't garner enough votes because of the oil spill in the Gulf of Mexico. "When it comes to getting 60 votes for legislation that includes additional oil and gas drilling with revenue sharing, the climb has gotten steeper because of the oil spill," the GOP senator said in a news release. "I believe there could be more than 60 votes for this bipartisan concept in the future," Graham added. "But there are not nearly 60 votes today and I do not see them materializing until we deal with the uncertainty of the immigration debate and the consequences of the oil spill." Sources familiar with the senators' plans say Kerry, D-Massachusetts, and Lieberman, I-Connecticut, intend to keep proposals to expand oil drilling, but they understand that safety regulations and standards will and should be scrutinized and added to their legislation in the wake of the BP Deepwater Horizon oil spill. Kerry, Lieberman and Graham were set to announce what was to be a bipartisan bill April 26 but abruptly canceled their news conference after Graham angrily withdrew because of a dispute with Democratic leaders over immigration reform. Graham said he was furious that Senate Majority Leader Harry Reid, D-Nevada, had signaled that he wanted to try to take up another controversial and divisive issue -- immigration reform -- before climate change. "Moving forward on immigration -- in this hurried, panicked manner -- is nothing more than a cynical political ploy," Graham wrote in a sharply worded letter April 24. In a joint statement Friday, Kerry and Lieberman thanked the Republican for his contribution. "Over the past several months we have worked with Senator Graham and he has made a significant contribution to construct balanced legislation that will make our country energy independent, create jobs and curb pollution," the statement said. But they also took a subtle swipe at Graham and his decision to stop work on climate change because of anger over immigration. "Over the last three weeks, we all understand Lindsey has been busy with the immigration issue and we understand his feelings on that issue, but during this period we've continued working, moving forward, and talking in great detail with our Senate colleagues on both sides of the aisle, and with the environmental and business communities," they said in their statement. They also hit back at Graham's assertion that the oil spill has made it impossible to find 60 votes to overcome a filibuster to pass the bill, which includes a call to expand oil drilling both on- and offshore. "We've continued to work with the Senate leadership and the White House, and we believe we've made new progress on the path to 60 votes," Kerry and Lieberman said in their statement. Sen. Bill Nelson, D-Florida, has vowed to filibuster any legislation that includes an expansion of offshore drilling. And several senior Democratic sources say they agree with Graham's assessment of the fate of this legislation: that, despite the renewed push, it's unlikely that climate change legislation will make it to the Senate floor this year. The House passed its version of the climate change bill last year.